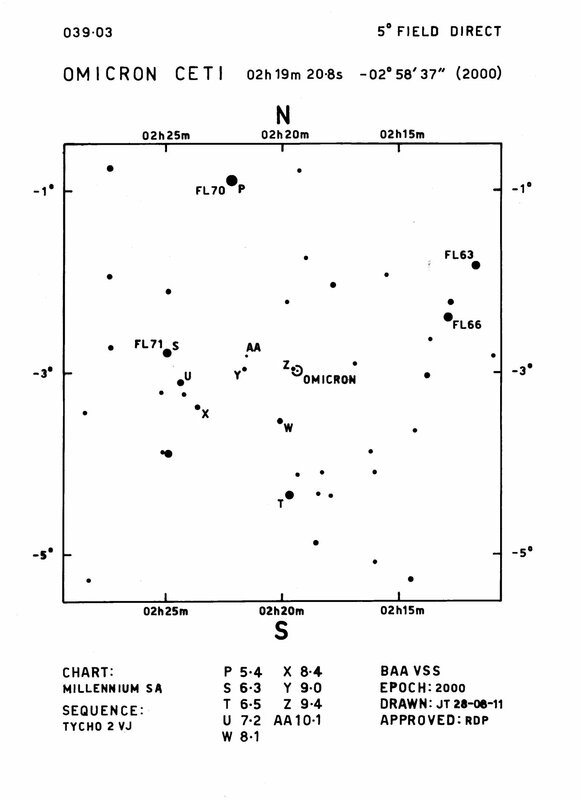 On the morning of August 3rd, 1596, German astronomer David Fabricius used an unmarked third magnitude star in Cetus as a reference point for marking the position of the planet Jupiter. 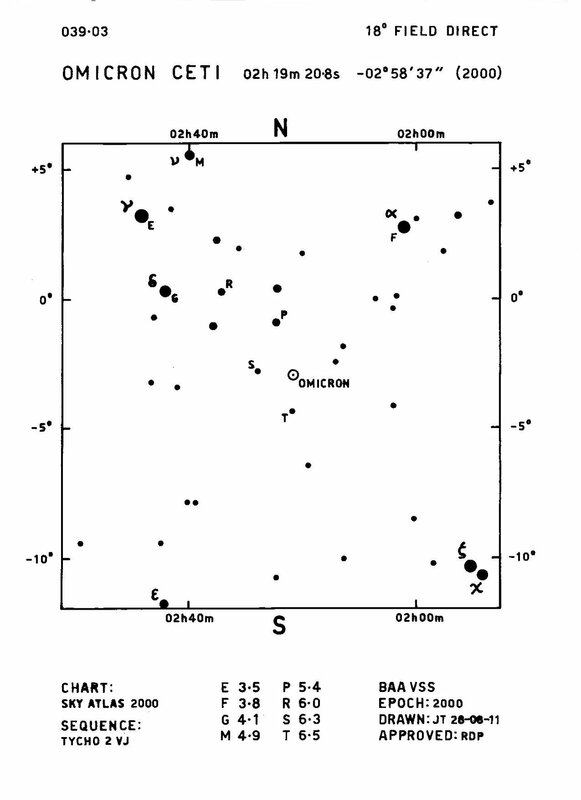 When he returned to that star three weeks later he noted that it had brightened by a whole magnitude, but by October the star had faded below naked eye visibility and the event was interpreted as a Nova. Fabricius recorded it again in 1609, by which time other astronomers had begun to make observations themselves. In 1638, the Frisian astronomer Johannes Holwarda determined a period of 11 months for the stars reappearances in the night sky, and is generally regarded as the discoverer of the stars variability. The Polish astronomer Johannes Hevelius named it Mira – the wonderful – in his publication Historiola Mirae Stellae in 1662, simply because no other star behaved in such a manner. 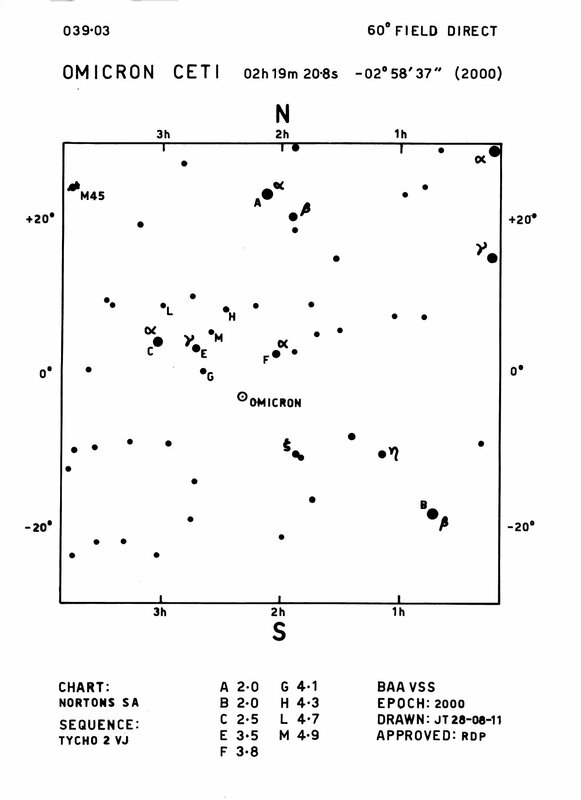 We now know it as omicron Ceti, the first variable star to be (officially) discovered, and would later lend its name to a whole classification of variable stars – the Mira type pulsating stars! Mira is a red giant AGB pulsating star of spectral type M7, some 650 million km in diameter yet only slightly more massive than our sun at 1.2 solar mass. It’s magnitude range is 2.0-10.1V and its period is 331.96 days. Mira is also a double star, with it’s white dwarf companion itself a variable star known as VZ Ceti. The orbital period is a very lengthy 500 years! Some sources indicate that the companion may be a main sequence star of 0.5 solar mass, yet recent studies seem to indicate that the companion is in fact a white dwarf which is accreting material from Mira’s stellar wind. The two stars are separated by ~100 AU, and the whole system is ~350-400 light years from Earth. Binary systems such as this are also regarded as a symbiotic star system, and Mira and VZ Ceti are in fact the closest of this type of variable star to our Sun. 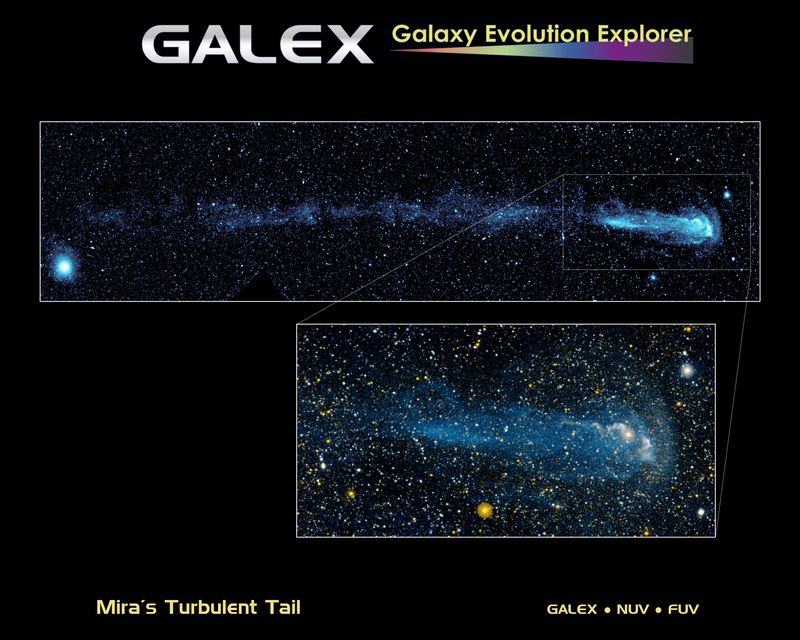 In 2007 the UV satellite Galex discovered that Mira was speeding through space at 130km/ps (proper motion of 10 milliarc-seconds per year), and leaving in it’s wake a tail of shed material 13 light years long, revealing a history of Mira’s mass loss over a period of some 30,000 years. The truly remarkable image can be seen here. The winter of 2018 is the perfect time to observe this amazing star for yourself – without the need for any optical aid - and as I write these words (January 8th), Mira is approaching maximum magnitude and is an easy naked eye star in the evening sky as darkness falls (on January 7th it was seen at mag. 3.7 with the naked eye from Birmingham). This maximum follows one of the faintest minimum on record, when Mira reached a mean magnitude of 10.26 at the end of September and the beginning of October 2017. The last time Mira was seen as faint as this was in 1930! The BAAVSS have produced three charts to enable observers to monitor the whole phase from maximum to minimum – a 60-degree chart for maximum, and 18-degree and 5-degree charts as the star fades. These are available for download from the Variable Star Section's website, following the Charts, Cet and then Omi Cet links. The BAAVSS has over 17,000 observations of Mira dating back to 1885, so why not add to them by reporting your observations to the section? Don’t worry if you haven’t made a variable star estimate before, as there is always plenty of advice available from the Section Officers. And whilst you are looking at this remarkable star with your naked eye, just try to imagine this enormous pulsating red giant decreasing in size as it approaches maximum, then expanding as it fades, its mass loss to its companion star, and the amazing 13-light year long tail left behind as Mira whizzes through space. Has any star in our night sky ever been so appropriately named?